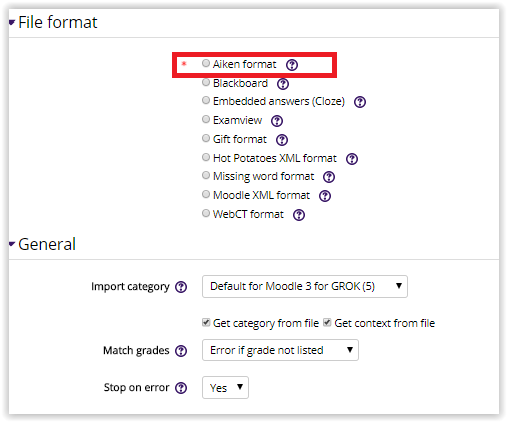 Aiken format allows instructors to create their questions in programs such as Microsoft Word, Notepad, or text editor, and then add them to Moodle. 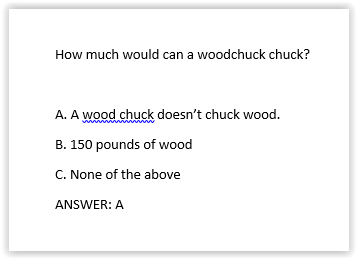 It's a simple way to add readable multiple choice questions. To use Aiken format, the questions must be formatted correctly in said programs. Questions should all be on one line. Every answer choice must start with an uppercase letter followed by a period or right parenthesis, and then a space. The answer line must immediately follow starting with "ANSWER: " Note that there is a space after the colon. Save files as .txt (plain text) file in UTF-8 format. 1. Login to Moodle and open the course you need to add the question to. 2. In the Administration block, click Question Bank, and then click Import. 3. Choose the Aiken option and change the general settings how you see fit. 4. Add the file by dragging and dropping into the box or by clicking Choose a File and searching for the saved file. 5. 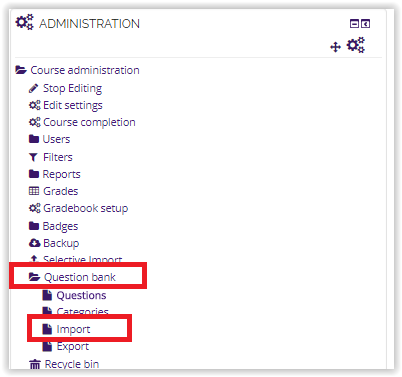 Click Selective Import, and the Aiken file will be added to the question bank.